Think of the SOLUTION-2 programming as connecting a series of LINKS in a CHAIN. 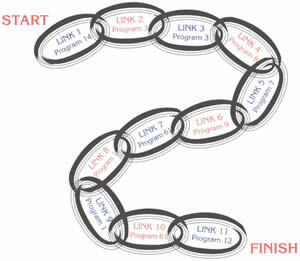 Each LINK of the CHAIN contains a PROGRAM. Each PROGRAM consists of a complete set of instructions that you enter to operate valves, check inputs, and if desired, do a complete weld sequence (SQUEEZE, WELD, HOLD, etc.) There is space for 70 complete PROGRAMS in the SOLUTION-2 solid state (no battery) memory. Notice that since the same PROGRAM can be used in any number of LINKS, it is only necessary to enter the repetitive operations one time. The SOLUTION-2 then performs the selected PROGRAMS one LINK at a time. By selecting various operating modes, this sequence can be continuous, or can be interrupted at various points and continued as desired. The SOLUTION-2 comes with the ability to store and use up to 15 different CHAINS. Each CHAIN can have up to 45 LINKS. Each LINK can select from 70 PROGRAMS in the control's electronics memory. This advanced system, by Unitrol Electronics, allows fast and easy setting of even the most complex welding sequences with the minimum number of English language steps entered from a 17 button keypad. Absolutely no codes are required when programming the SOLUTION-2. SOLUTION-2 comes complete with 32 digit alpha/numeric display and a security keyboard lock. The powerful SOLUTION-2 can eliminate the need for a PLC on many complicated sequence welding systems!